One of Metropolitan Klezmer's specialties is the fascinating range of music found in vintage Yiddish film soundtracks, from tango to tragic lullaby to tenement wedding dance and much more. Program can be presented also with archival movie clips in a multi-media concert, as seen at venues nationwide such as Lincoln Center. 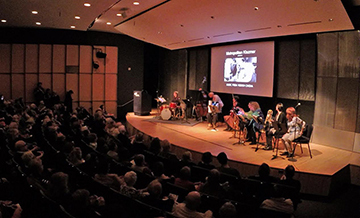 Our Music in Yiddish Cinema multimedia program has been presented from coast to coast, including The New York Public Library for the Performing Arts at Lincoln Center and NYC's landmark Museum at Eldridge Street where Metropolitan Klezmer performed to packed houses. "... tonight at the famous, recently reopened synagogue at the base of Eldridge Street, Metropolitan Klezmer reminded why they're one of the foremost groups in the current wave of klezmer revivalists. But they didn't do it with the party music. Instead, bandleader/drummer Eve Sicular who's also a film historian, assembled a program of incidental and theme music from Yiddish film from the 1930s and 40s, from both the US and the Soviet Union. The band interpolated their songs — a mix of instrumentals and vocal numbers — between movie clips which played on a screen on the left side of the gorgeously renovated synagogue." "While other bands add Jewish music to a movie, Metropolitan Klezmer has been reversing the process for many years, deriving some of its repertoire from Yiddish cinema classics. In April, they will devote an entire concert to the Metro/movie nexus. Given Bandleader Eve Sicular's lifelong interest in film, this is a logical development. 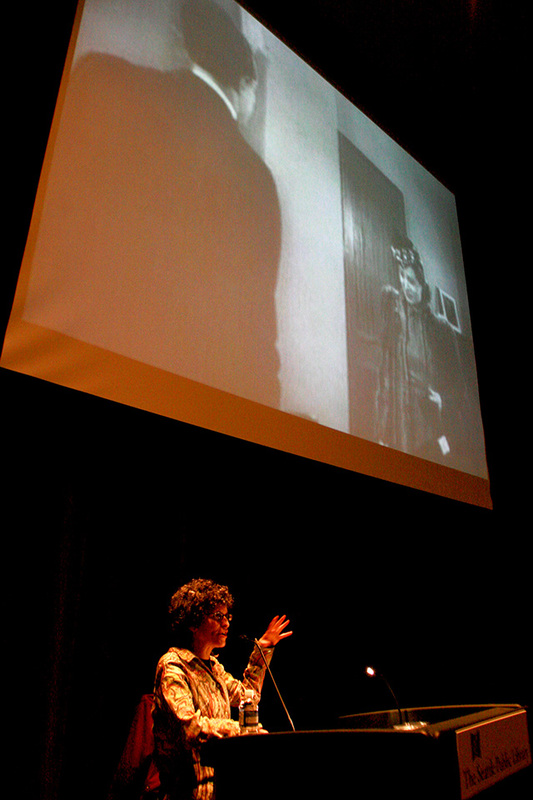 After all, Sicular was an assistant to the curator on the Museum of Modern Art's famous Yiddish film retrospective in the early 1990's, an event whose impact on the revival of interest in Yiddish culture has yet to be measured." Metropolitan Klezmer performing "Uncle Moses Wedding Dance" live from New York at the Drom nightclub, April 2009 for the band's 15th anniversary show. Traditional folk dance tunes adapted from the soundtrack of Uncle Moses [1932, USA] and a field transcription by Moishe Beregovsky [USSR] were arranged for Metropolitan Klezmer by Eve Sicular. 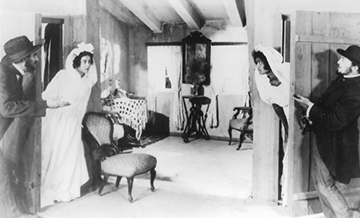 Opening and closing melody as heard in tenement wedding scene of early Yiddish “talkie” feature starring the film's director, Maurice Schwartz, in the title role. Debra Kreisberg, clarinet; Pam Fleming, trumpet; Reut Regev, trombone; Ismail Butera, accordion; Michael Hess, violin; Dave Hofstra, bass; Eve Sicular, drums. Live and studio recorded versions appear on both our Surprising Finds and Traveling Show CD releases. Former curator of Film & Photo Archives at YIVO Institute, Eve wrote her Harvard honors thesis on early Soviet film innovator Esther Shub. 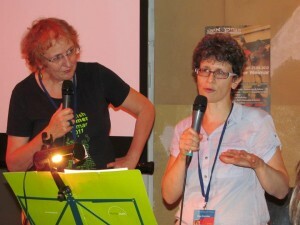 Bandleader Eve Sicular presents her solo lecture version of "Music in Yiddish Cinema" for Yiddish Summer Weimar 2012 (pictured w/ German translator).